I have great designers, animators, editors on board and think it may just work.. There are Three CDs coming out before the Autumn and this is definitely one of them! NB, Other releases are to be a piano album (including Crystallised Beauty) and a CD of my odd cello/orchestra soundscapes (including Close Your Eyes). Click the play button to hear tracks including O Dolce Nocte featuring Alamire and Fretwork. The reason I’m writing though is that I’m going to need help (hopefully yours!) getting the word out there about the Henry CD as this is a small-label release, but I’d love it to reach a wide audience. There’s no financial drive behind this, as I’m just as happy to distribute tracks free when I can. Your suggestions matter very much, as it’s only because of the comments on this page here – that the companies have agreed to let me make the CD! So all ideas as to how & if you’d like to own it, which radio stations I should approach, what kind of packaging you’d like used, which tracks you’d want on there (I will put the credits music on! ), even how much it should cost… will be very gratefully received. I’d also like to put suggested artwork online, so you can help me choose what it should look like. I’ll send you a Henry mp3 right away by way of thanks if you drop me an idea! Anyway, I saw your twitter link a few days ago to that girl with the great Coffee table style Album work. Perhaps something incorporating elements from the BL exhibition. I can put you touch with design team at Vitra if you like. I’m getting clearance for some of the calligraphic elements, so that sounds the right path to take. Great idea… though ME in period costume is a bad idea… Having said that there is some lovely footage of the choir in costume.. You are a genius! I rather like the coffee-table idea; you could do this Ken Burns style releasing the music with a bio book based on the series. Perhaps David Starkey could write it? The liner notes in the cd could be about your research into Henry’s music. That’s all great. 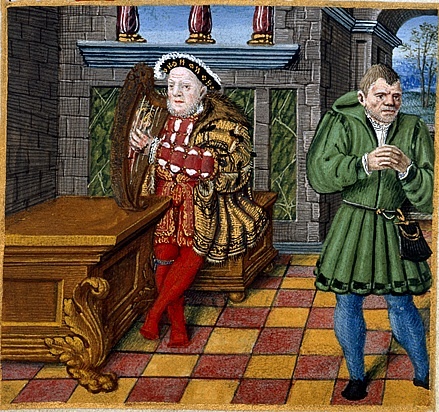 I’m quite averse to being on the cover of my CDs… but even I may look slim compared to Henry VIII! Philip – Do you fancy doing a quick email question-and-answer interview for the British Library Henry VIII Exhibition blog? We put up some excerpts from the Mind of a Tyrant series on our exhibition website, so we could talk about the music you wrote and highlight the release of the CD. I was going to point you to Trent Reznor’s site, where he made a forum post concerning the self ,marketing of music in the 21st century but I could find the link. The Long and short of it is, today we have an “experience economy” meaning that people dont want a product (esp if they can get it for Free) they want the “Experience” something you can’t get from a download. So infact ALL of your ideas are valid. (including a “Live” tour). The idea is to offer, for free, the Downloads in a lower quality bitrate version, it still sounds good on your iPod but not “Audiophile” quality. Same thing with spotify. blip and last.fm. However higher quality exclusive DL.s would cost some change. The Coffee table book is a marvelous idea but once again you want to pull the reader/listener into your experience with more bits of exclusivity, Limited edition hand signed versions, etc. I’m not so sure about traditional Radio play but many Classical stations in the US and on Satellite, have features of Music from movies and TV so hooking up with those outlets will give it wide exposure to a more general audience. As I said earlier “Live” performance is where its at nowadays for artists making money and Record companies signing so-called 360 deals where they get a cut of everything but it doesn’t seem like you want to go down the route. Also since live touring may not be an option for you there is the possibility of setting up Virtual tours where local Orchestras Feature your music in conjunction with the BBC America debut of your programme. Of course I don’t know how feasible or desirable this is for you or if you have already gone through this but I though I would throw it out there. I also think it would be a really good idea to include with the CD some small video files or hidden audio tracks of interviews or other such extras. So many people love your music, but, as others have pointed out, getting people to purchase is about providing a unique experience above and beyond simply listening to the tracks. The coffee-table book idea is also a really strong one. I was wondering, would it be possible to get adverts along side those for the DVD of the series? Just a thought, can’t wait for the CD to come out! Perhaps one way to help publicize the music would be to let music departments at colleges/universities be aware of it, especially those with professors who focus on medieval/Renaissance music. They could then pass the info on to students. Don’t know what you think about Facebook but I think it would be a good way to get your music out there to be heard. There is a group on fb called “I (heart) Tudor History”, here is the link (http://www.facebook.com/photo.php?pid=302134&id=1631391386&ref=nf#/group.php?gid=2391613779) if you want to go that route. Or if you want to send me the link to your music I could post it with rave reviews on fb since I’m a member of the group. Just a thought! Can’t wait for the Henry VIII music. Quote from message just in..
‘Hello, thank you very much for responding and for the track, I love it, I do not speak English very well, but here is an idea I hope you like it:) I love music, I play the guitar, a little bass, the flute and piano. I hope that you serve, thank you very much:) take care. I watched the Henry Viii MOAT, and fell in love with the music instantly, i kept rewinding Sky+ to play it over and over again!! Although I fly now I used to be a musician and the medieval harmonies simply put the hairs up on the back of my neck. However it did take me quite a while to find you on this website. I do hope that you are able to release the album. I have no experience in the world of marketing but from my own preferences I would love the coffee table idea, or if Channel4 would allow perhaps a book to accompany the series along with the album would be super. I think obvious choices for advertising is Classic FM but I agree that a trailer or teaser on Youtube, Facebook or Twitter would generate a lot of interest. There must be magazines out there specialising in Medieval history or music. I know none of this helps, I do apologise, but I hope to see the album very soon. This all helps immensely. I want to make something that is right for the person who hears it, and your ideas are clear and of great value! Well whatever you do, I’ll be excited to see the final product! This is great music; I’m enjoying it very much. Although this music absolutely deserves a real CD release. If released on-line it should definitely come with artwork you can print your self. Should you sell the music online without a physical CD release, then make sure people can also pay with Paypal. And keep it cheap, I would not buy it on a full prise new CD, but if I could download it officially for a low price I would be happy to pay.